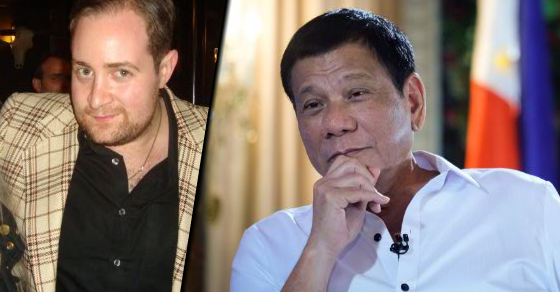 Adam Garrie, a geo-political expert seen on international tv, said that despite the malevolence and downright viciousness in the liberal media, facts show that President Rodrigo Dutere remains to be one of the world's most popular leaders, as seen from empirical data. "While Duterte’s critics are small in numbers, their vocal belligerence is a discredit to reality and indeed this is the very point at the heart of his critics’ agenda. Duterte’s critics seek to hide the truth regarding the President’s popularity behind a rusty shield of dishonesty, disinformation and outright lies. A leader such as Duterte comes along once in a generation. His continued popularity is therefore a reflection of the history making leadership of Rodrigo Roa Duterte." Garrie, director at Eurasia future made the remark after the release of the Social Weather Stations Survey's results where Duterte's ratings rose in the survey conducted June 27-30. According to the survey and as quoted by Garrie, uterte enjoys an 88% approval rating while 87% of Filipinos continue to have personal trust in the President’s leadership, which is an increase from his rating in March where his approval was at 80% while his trust rating was 79%. Garrie said that it is Duterte's leadership skills that got him to where he is, being the conventional leader, as a man who wears his heart on his sleeve and a man who speaks neither above nor below, but directly to the people. "This kind of leadership has instilled a sense of pride in the wider nation, even among those who might want Duterte to swear less, but who nevertheless appreciate the fact that Duterte says before the cameras what most people only say in private. This itself is a symptom of Duterte’s brutal honesty that people throughout the world tend to seek in a leader," he said. He said that a further element which attests to Duterte’s strong popularity is the sheer incompetence of his most vocal opponents, naming former Chief Justice Ma. Lourdes Sereno and Vice President Leni Robredo, and the catholic church, which he says has more scandals than a corrupt government. He noted how Duterte's ratings are higher than that of other leaders. "While directly elected leaders of the wider ‘global east’ including Russian President Vladimir Putin and Turkish President Recep Tayyip Erdogan continue to win elections and maintain their popularity, Duterte’s recent approval rating is even higher than the perennially strong numbers associated with Putin and Erdogan. When it comes to major European and North American leaders there is simply no contest. " He noted how United States President Donald Trump's apporval rating is only 47 percent, France President Macron having scored a recent approval rating of 40%, while in Europe, Angela Merkel of Germany and Theresa May of Britain are facing open rebellions within their governments. Garrie said that most elected leaders would crave numbers that are even close to those consistently achieved by President Duterte but many fall short because they prioritise the dishonest, duplicitous politics of the past over a direct future minded approach to popular engagement. "Duterte’s popularity is therefore not a symptom of vanity but symbolic of national revitalisation at all levels. Some leaders fail to transform the mentality of even their strongest supporters after many years in power. By contrast, Duterte has already transformed the mentality of his nation after just over two years in office while his constitutional reforms seek to indelibly change the political fabric of The Philippines for years to come."